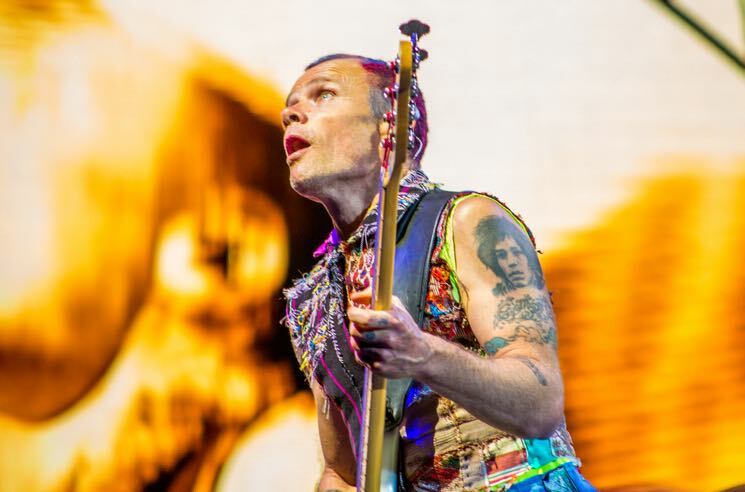 Flea Calls Red Hot Chili Peppers Retirement Rumours "Silly Talk"
Last week, Red Hot Chili Peppers drummer Chad Smith sparked rumours of the rockers retiring, telling The Eddie Trunk Podcast that "the touring part… I don't know if we can continue." Now, bassist Flea is looking to put any and all hearsay to rest. Speaking with TMZ, the bassist called the rumours "silly talk," saying, "We never really look past the immediate future, but we're on tour right now, we're rocking out, we feel in the spirit, letting the music move us." He continued, "To be honest, since we first started this band 35 years ago, I've never ever known what's next or round the corner or anything. I think the power of the band lies in that — just staying in the moment and the energy that's moving." Smith had told the program that the band "were riding in a van after a gig and Flea was like, 'How much longer do you think we should… How do you think we should end this?'"